FCRA Compliance | Justifacts Credential Verification, Inc.
Justifacts has over 35 years of experience with FCRA Compliant pre-employment and post-employment background check services. 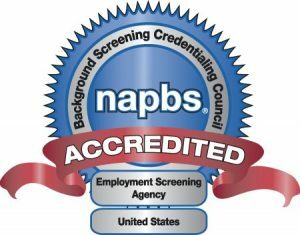 As an accredited company with the National Association of Professional Background Screeners (NAPBS), we are very familiar with the Fair Credit Reporting Act (FCRA), state laws, EEOC guidelines and other relevant laws and regulations. We operate in full FCRA Compliance with these laws and guidelines. Our Compliance Department stands ready to assist you in navigating the complex patchwork of laws and regulations. Members of our Compliance Team are recognized experts and have achieved their advanced FCRA Certification through the NAPBS. Most importantly, we will conduct routine audits surrounding the use of consumer reports and background checks in order to be proactive in correcting any potential violations. In addition, Justifacts does not outsource any verifications to overseas call centers. We are dedicated to keeping all personally identifiable information in the United States. Free Adverse Action Tool featuring a dynamic state law application which recognizes and provides notices in accordance with relevant legislation to ensure complete FCRA compliance. Justifacts’ dedication to compliance is reflected in our NAPBS Accreditation. To become accredited, Justifacts had to pass a thorough on-site audit of our policies, procedures and best practices. Clients can feel confident that the program at Justifacts has been independently audited and found to be of the highest quality in regards to our commitment to data security, FCRA compliance, service quality, and minimizing workplace risk. Is Your Current Background Screening Program FCRA Compliant? Justifacts background check reports are disputed less than 0.01% of the time. Rest assured, Justifacts reinvestigates all disputes at no charge to consumers. Additionally, Justifacts will provide report copies upon request of the consumer. Due to the amount of regulation over consumer reports, Justifacts strongly recommends that you consult with your legal counsel and other appropriate personnel. They will be able to help you develop, review, and implement a background screening policy and an adverse action process.